Immanuel Kant was a highly influential German philosopher. Kant is often considered the father of modern philosophy. He mainly worked in the fields of epistemology, ethics, and aesthetics. His work has revolutionized these fields and also other fields such as metaphysics and political theory. His work in philosophy has been compared to Copernicus' finding that the Earth actually revolves around the sun. Kant also was one of the first people to push for international cooperation and democracy because he believed that world peace could be achieved through this. Kant's most famous work is Critique of Pure Reason. 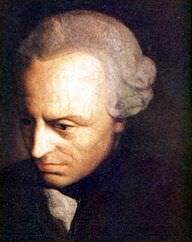 Immanuel Kant was a famous German philosopher, who was born on April 22, 1724. As a person born on this date, Immanuel Kant is listed in our database as the 6th most popular celebrity for the day (April 22). People born on April 22 fall under the Zodiac sign of Taurus, the Bull. Immanuel Kant is the 87th most popular Taurus. Aside from information specific to Immanuel Kant's birthday, Immanuel Kant is the 10th most famous German. In general, Immanuel Kant ranks as the 1021st most popular famous person, and the 4th most popular philosopher of all time. “The Famous Birthdays” catalogs over 25,000 famous people, everyone from actors to singers to scientists to serial killers and more. If you're curious to see who was born on your birthday, you can use our database to find out who, what, where, when and why. You can search by birthday, birthplace, claim to fame or any other information by typing in the search box, or simply browse our site by selecting the month, the day, the horoscope, or any other clickable option.